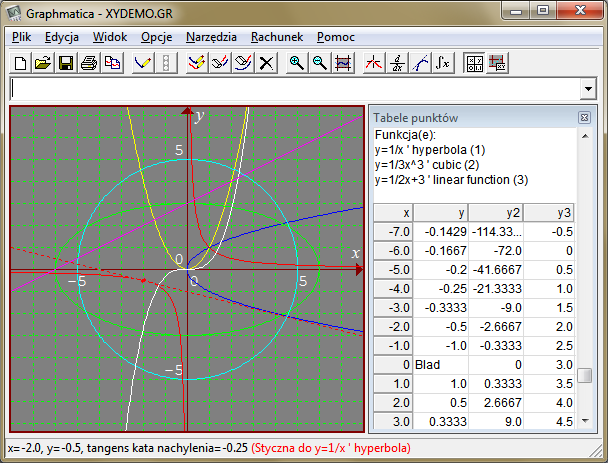 Graphmatica version 2.4 is designed especially for Windows 2000/XP/Vista/7/8.x. The Redraw Queue. Graphmatica remembers up to the last 999 equations you typed in or loaded from a file. You can save your work for use in a later session or with any text editor. Advanced equation parser follows mathematical rules--not the computer's. You can use implied multiplication, a complete library of math functions (including trig), and even leave out those annoying parentheses in appropriate places. Forget about isolating variables before graphing! Graphmatica will isolate the dependent variable for you, if possible, and even graph many relations that can only be specified as implicit functions. Powerful graphing engine. You can choose between six styles of graphing: regular Cartesian, polar, parametric, and slope-field and initial-value approximations for up to fourth-order ODEs (and fourth-order linear systems as well), all detected automatically based on which variables you use in your equation. Cartesian inequalities are supported as well. Most graphs appear instantly on Pentium-class machines. Data plotting and curve fitting support make it easy to highlight points on a curve or enter experimental data sets and find the equation of best fit. Easy to use controls, including a toolbar, right-click popup menus, the status bar, which displays relevant information and help messages, and the Redraw Queue combobox, which lets you select any equation in memory to graph, delete, or edit to form a new equation. Pause and Point tables options let you see the coordinates of points on your graphs... as they are drawn. The Point tables show values at an interval and precision that you control, so you can get detailed numerical results or practice sketching curves yourself. Convenient mouse-oriented operations. You can use the mouse to select a new range or view the coordinates of a point, select the initial value for an ODE, and even find the tangent line of a curve or integrate a function without pressing a single key. Flexible graph paper. Choose between regular graph paper and paper appropriate for trig, polar, and logarithmic functions, at four levels of detail. Powerful symbolic and numerical calculus features. Find intersections between curves, derivatives, integrals, and critical points for any Cartesian function. Lots of output options. Graphmatica lets you copy equations, point tables, and graphs to the clipboard, and you can choose from two levels of print quality for faster or better printouts when you print your graphs. Every automatic option is also user-settable to give you absolute control over your graphs. The Options Settings dialog not only shows you the current settings, but also acts as a master control panel to let you change any customizable option from one dialog box. And your preferences are saved automatically restored whenever you run Graphmatica (you can also disable autosave on exit and use the Save Setup Info command to save your preferences manually). Instructive help topics explain the basics of each type of graph...and included demo files show you examples of each form of equation.